Taipei officially known as Taipei City, is the capital of Taiwan (officially the Republic of China). Situated at the northern tip of Taiwan, Taipei is located on the Tamsui River; it is about 25 km (16 mi) southwest of Keelung, a port city on the Pacific Ocean. It lies in the Taipei Basin, an ancient lakebed bounded by the two relatively narrow valleys of the Keelung and Xindian rivers, which join to form the Tamsui River along the city's western border. The city proper is home to an estimated 2,693,672 people. Taipei, New Taipei, and Keelung together form the Taipei - Keelung metropolitan area with a population of 6,900,273, the 40th most-populous urban area in the world. They are administered under three municipal governing bodies. "Taipei" sometimes refers to the whole metropolitan area, while "Taipei City" refers to the city proper. Taipei City proper is surrounded on all sides by another city called New Taipei. Taipei is the political, economic, and cultural center of Taiwan. Considered to be a global city, Taipei is part of a major industrial area. Railways, high-speed rail, highways, airports, and bus lines connect Taipei with all parts of the island. The city is served by two airports –Taipei Songshan and Taiwan Taoyan. Taipei officially known as Taipei City (Chinese: 臺北市 or 台北市; pinyin: Táiběi Shì; Pe̍h-ōe-jī: Tâi-pak Chhī), is the capital of Taiwan (officially the Republic of China). Situated at the northern tip of Taiwan, Taipei is located on the Tamsui River; it is about 25 km (16 mi) southwest of Keelung, a port city on the Pacific Ocean. It lies in the Taipei Basin, an ancient lakebed bounded by the two relatively narrow valleys of the Keelung and Xindian rivers, which join to form the Tamsui River along the city's western border. The city proper is home to an estimated 2,693,672 people. Taipei, New Taipei, and Keelung together form the Taipei–Keelung metropolitan area with a population of 6,900,273, the 40th most-populous urban area in the world. They are administered under three municipal governing bodies. 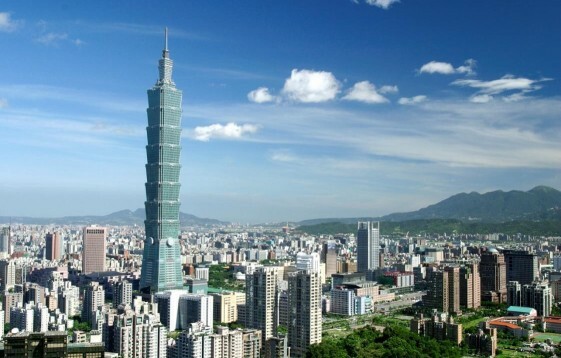 "Taipei" sometimes refers to the whole metropolitan area, while "Taipei City" refers to the city proper. Taipei City proper is surrounded on all sides by another city called New Taipei.